Edward Jacobs (b. 1961, Brookline, MA) began playing violin at age 8, but abandoned that at age 11—upon hearing a friend's jazz quartet—in favor of the saxophone. Work at the University of Massachusetts, Amherst (B.A., 1984) in jazz performance and arranging (Jeff Holmes) and composition (Sal Macchia, Robert Stern) was followed by study in composition (Andrew Imbrie, Olly Wilson, Gerard Grisey) and conducting (Michael Senturia) at the University of California, Berkeley (M.A., 1986) and at Columbia University (composition with Chou Wen-Chung, Mario Davidovsky, Marty Boykan, George Edwards; conducting with George Rothman) where he completed the D.M.A. in 1993. In 2001 Jacobs began to include electronic media in some of his works. 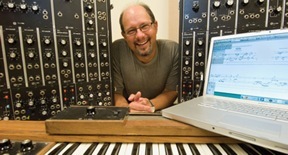 He has since written works for computer-generated sound with clarinet (A Function of Memory, 2001, Beauty Shop, 2005), with cello (al momento, 2002), piano (echoes, shadows, 2008), and for dancers (dis/Connect, 2004). His music, which is primary not inclusive of electronic media, is published by C. F. Peters Corp., NY, APNM and ACA. In 2005 Jacobs’ work as a composer was recognized by a Charles Ives Award of the American Academy of Arts & Letters. The Academy’s citation reads “Edward Jacobs’s music masters the ‘virtual’ and ‘real’ sound habitats and embeds them into a unified and consistent single space with grace, broad orchestral imagination and expressivity. Jacobs’s music is immediately engaging, attractive and intellectually demanding.” Jacobs began teaching at East Carolina University in 1998, where he was chosen for a Teacher-Scholar Award in 2004. His activities have also included the founding and direction of the Annual NewMusic@ECU Festival, begun in March, 2000; and work in the Pitt County Public Schools, collaborating since 2004 with middle school general music teachers in his “Young Composers Project”, which strives to make the creation of music a fundamental part of our childrens’ education. Jacobs’ strongest influences are artists in a variety of media whose work inspires new approaches to his work and open up previously unexplored areas of his imagination. Time As A Fly for 2 vlns, 2vla, vlc.